Just encase you didn't get the memo, Jackie Stallone is a famous American astrologer, probably better known as the mother of both Sylvester and Frank Stallone. 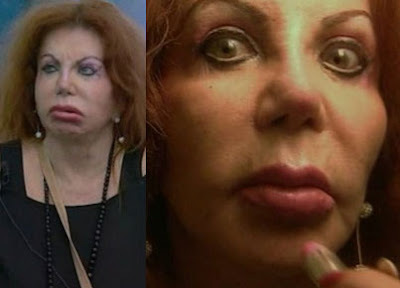 Poor Jackie Stallone refused to let herself age gracefully, instead she has become one of the most notorious plastic surgery victims in Hollywood. Clearly an extensive amount of plastic surgery has been done to her face, which appears to include a Facelift along with a brow lift, cheek implants and a nose job. And don't even get my started on those explosively plump lips, i wonder if she went all out and got lip implants or simply the injections? Either way, this plastic surgery experiment was a complete mishap. 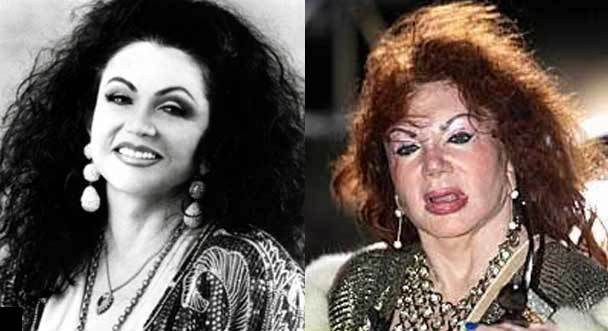 I can't wait to hear some feedback from the readers, regarding Jackie Stallone's cosmetic nightmare. The old self hating Jew- got what she deserved! She looksd like she's had a couple of strokes and developed Down Syndrome along the way. Poor thing. Yikes! She's like a critter created by Viktor Frankestein! I would not want to see that face in real life....My nightmares are sorted for tonight, thanks!